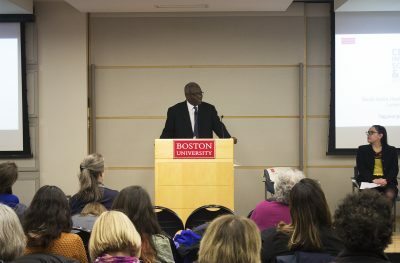 The Boston University Center for Innovation in Social Work and Health hosted a panel discussion on social work’s role in managing health inequities in Boston on Thursday in the Photonics Center. The panel was the center’s third installment in its series. Two graduate students studying social work and public health, Nandini Choudhury and Tina DuBois, helped organized the event. Choudhury said she wanted the panel to draw attention to a critical, but undervalued field. Madeline Wachman, the program manager of the Center for Innovation in Social Work and Health, opened the discussion with a similar sentiment. “We wanted to shine a light on various populations and innovative work in the field, as well as the eclectic platter of opportunities and events in order to highlight health inequities in Boston,” Wachman said. School of Public Health Associate Dean Harold Cox moderated the discussion among the three panelists, all women of color working in the field of public health and social work in Boston. Ilyitch Nahiely Tábora, the chief of staff for the Mayor’s Office of Health and Human Services, talked about her early experiences with social inequity and how it related to her work now. “Throughout my youth, growing up in the public schools, [the question of] why we were being treated differently was very important to me,” she said. Tábora said she takes great pride working with Mayor Martin Walsh, who she believes makes an unprecedented effort to tackle race-related issues in Boston. Rita Nieves, deputy director of the Boston Public Health Commission, said her work with the BPHC has made great strides in closing the gaps caused by racial and housing inequities. “If I told you that, back in 2006, we did not have an idea of the race, gender, ethnicity of the patients that were being served by the healthcare system [in Boston], would you be surprised?” Nieves asked. Janine Anzalota, executive director of the City of Boston’s Office of Fair Housing and Equity, talked about her work in resolving race-related housing discrimination. She said her office investigates local housing discrimination and provides policy guidance to government agencies. Anzalota highlighted the influence of government in racial equity issues. Several students and Boston residents who attended the panel said they felt connected to the various issues discussed. Anna Leah Eisner, a senior in the College of Arts and Sciences, said it is important for not just social workers but also students to fight for racial justice. Richard Cresta, 53, of East Boston, said he found the discussion to be thought-provoking and personal.